Luca Luca’s new creative director, Raul Melgoza, explains how he sets the tone and vision for Luca Luca Spring 2009 and onward. “I took the idea of the body, sculpting the body - more youthful, more sportswear driven,” says Mr. Melgoza. Mr. Melgoza says he wants to transform Luca Luca from the red carpet style brand to a lifestyle brand. Many of the looks are in white, focusing on fitted, tailored silhouettes, sleek cuts and the fabric itself. 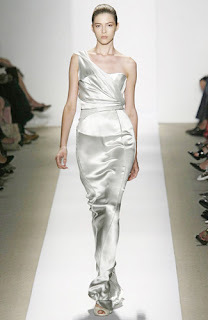 Silk organza and cotton viscose dresses, tanks, high waisted skirts and cuffed shorts are key pieces for Spring 2009. The palette includes soft tones such as beige, khaki, blue and gray, with some pieces in burnt orange, purple.